Even though I didn’t read comic books heavily as a kid, I still love a good superhero movie. When I was younger, I read a few comics here and there, but by no means can I rightfully call myself a comic book nerd. While this is a bummer, I think it works to my advantage when it comes to the movies. What I’m trying to say is that I’m not as picky when I roll into a movie theater to see a superhero flick. That’s good and bad, but mostly good. I know enough to keep up, but I’m not familiar with every aspect of a super hero’s story. Subsequently, I don’t know what aspects of the movie versions deviate from the comics. If there are inconsistencies, it's unlikely I'll notice and that allows me to envelop myself in the story more easily than a diehard comic fan. Usually, I don’t like a movie unless it gets me thinking and makes an impact. Realistically though, I didn’t buy tickets to Captain America: The Winter Soldier, expecting a thinkfest. What I wanted was a thrill. Christoph was most definitely down with accompanying me on this cinematic journey and so we went, together. At the theater we jumped in line, got our tickets and found decent seats quickly, despite having arrived late. Our theater was mostly full when we walked in so we took a couple of seats near the front, on the floor. We were going to be sitting right up on that screen, but the seats there were infinitely more comfortable than those further back. I found a spot and settled in for what I hoped would be a good time. The moment I switched my phone to silent, I began tapping my foot impatiently. I was ready and I wanted some action. We meet back up with Steve Rogers (Captain America played by Chris Evans) while he’s out on a run. He’s racing around the National Mall when he meets Sam Wilson (Falcon played by Anthony Mackie). Playful and sincere, Rogers introduces himself after making it clear that he can run circles around anyone, anywhere. Wilson likes Rogers immediately and the story takes off from there. To be clear, I’m not kidding when I say that the story “takes off.” This movie keeps an intense pace, moving through the plot at breakneck speed. Usually, I’m all for keeping a story rolling, but I do need some time to connect with characters and invest in their adventure. Unfortunately, there is little time for that sort of thing in this film. 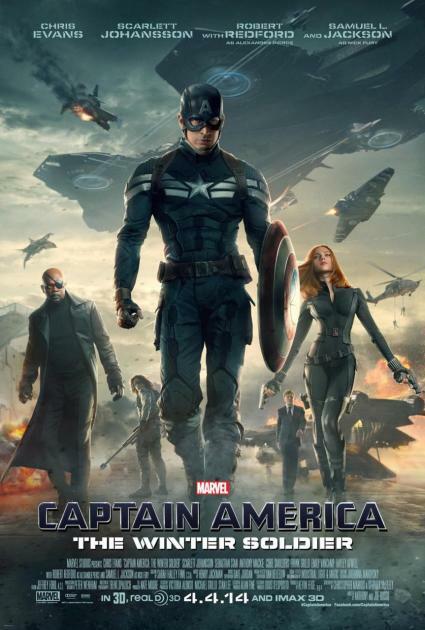 On the bright side, Captain America: The Winter Soldier is an exciting and thrilling, good time. The positive aspect of having a movie plow through the story is that you’re not left with much time to consider the notion of boredom. Additionally, this movie delivers exactly where it should: the fight scenes. I like my heroes to be badass underdogs (who doesn’t, right?) and Captain America is both and much more. He’s the nice guy—the little dude that showed them all. He’s basically what a bald eagle would look like if it were an impossibly ripped dude. He’s Chris Evans. Evans makes for an excellent Captain America. He brings us a superhero that’s gracious, sympathetic and above all, noble. Evans creates a hero that’s so virtuous, he borders on becoming a caricature of himself. In this particular instance, it works. Captain America is, after all, a comic book character and he’s meant to personify good ol’ American freedom and what’s freedom without honor? I enjoyed his performance, but not as much as all the ladies in the movie theater that gasped when they saw him on screen without his shirt on. Yes, he looks insanely good and yes I laughed out loud at the exclamations of desire. It was prefect, as is Evans in this role. I heard some folks were disappointed with Scarlett Johansson’s portrayal of Black Widow, but I felt she did the part justice. She was aloof, distant and a rebel, everything I would expect the live-action version of Black Widow to be. Sam Wilson / Falcon was, without a doubt, the standout of the supporting cast. He radiates “nice guy,” without coming off like a pathetic douche. Mackie is a sincere and down to earth renegade, which you can’t help but invest in, the moment you first see him on screen. 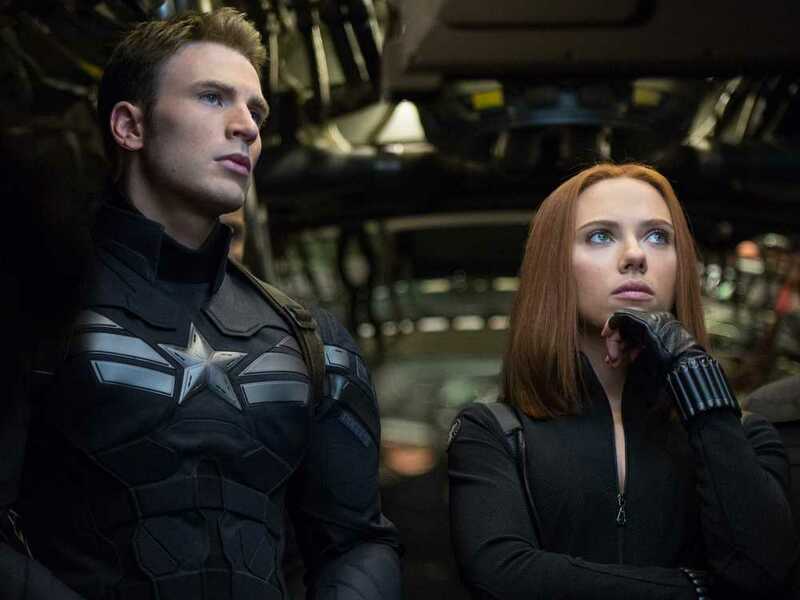 Captain America: The Winter Soldier feels more like an adventure than a movie and that’s exciting. The intense, perfectly choreographed and skillfully executed fight scenes were the best part and I’m not saying that to knock any other aspect of the film (e.g. the acting, story, or special effects). The fight scenes are fabulous; your eyes will widen and your blood will race as you watch this crew engage in close quarter combat. If you’re looking for adrenalin drenched action sequences, and you’re willing to overlook the fact that everything transpires a bit too quickly and easily for our hero, then give this movie a shot. It may not be an intellectual endeavor, but you’ll have fun and ain’t nothing more American than a little fun with a capital F.
B- = If you’re already out and looking for a good time, watch this at your local theater. I’m not telling you to go out of your way for a viewing. I guess you could maybe stream this instead if that would be easier. Either way, it’s decent times and you won’t be mad that I encouraged you to sit through it.